I once had a gentleman for a lesson, in his 70’s, who used to play off a 9 handicap but has crept up and up as he has matured in years to a 19 handicap. You can imagine he was a tad annoyed about creeping ever closer to the 20’s seeing as he was a former single figure golfer, something only a small percentage of golfers ever achieve. It was his first lesson and, before we started, I asked him, as I do with all golfers on their first lesson, what they want to get from their game and what have they been working on, if anything, this past few rounds or practise sessions. This guy was very honest. He said he watches a lot of golf, especially the PGA Tour, with lush fairways and quick greens. He had noticed something very striking in all the time he’d been watching the best players in the world in action. He noticed they took HUGE divots! Even some taking divots with their fairway woods and hybrid clubs. Now, I bet you know what he was trying to do in his game? Yep, he tried to take as big a divot as the pros on the TV. ‘But why is that a bad thing this guy tried to do that?’ I hear you say. Well, first of all, here was a man who predominantly cut across the ball and hit slices, played on fairly soft courses, especially in the winter, and he was trying to hit DOWN on the ball to an extreme effect to emulate those tour professionals and take big divots to help, what he thought, enabled him to play better golf and reach that level he had before. Unfortunately, the tactic was not working for him and he was getting frustrated with his game and, quite literally, was hacking up the course taking divots the size of a small country with the ball going barely 30 yards. Our first session took place on the golf course on a rather damp day, the kind this player didn’t like for obvious reasons. What did he do down the first hole? First 4 shots were heavy, huge great divots with him hitting very much down on the ball, attempting to copy the worlds best. Now for me this was an easy one. No need for technical instruction, no need for mechanics or endless amounts of time needed to spend out on the practice area. I simply said to him, ‘brush the turf, feel as though you’re taking the top layer of grass off and hardly touching the soil underneath’. This idea was completely alien to him! ‘Well hang on, why do the pros take big divots?’ he asked me. I explained to him that because they generate lots of club speed and create a consistently good angle of attack (approx. 4 degrees down with a short iron) they are able to make that ball then turf contact. When (with all due respect to him) 70 plus year olds don’t generate the same club speed and when they hit excessively down on the ball (approx. 8 to 10 degrees down) you get the turf ball contact that so many amateur golfers dread, watching the ball trickle 10 yards in front when they had 120 to go. I allowed him to hit a few shots from the fairway to practise this new theory, whilst I could see him still thinking I was mad for telling him something that he thought was completely wrong and against the grain! out the ground to be able to play his best golf, he barely had to touch the turf to get the ball to where he wanted it to go. 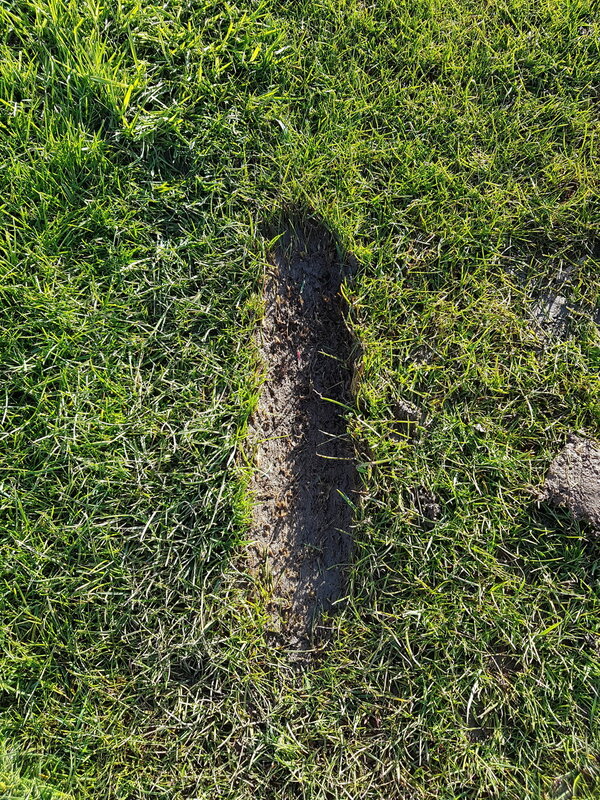 The divot tells us a lot about your swing and how you play golf. Do you take a divot? Do you take too much of a divot? Next time you’re out on the course, take a look and see how much turf, if any, you take up during your shot. A lot of people put emphasis and thought into the swing when the swing can’t give us much feedback into why we played a good shot or a bad shot. On the other hand, a divot can tell us a hell of a lot and provide us with necessary feedback……… direction of swing and angle of attack (hit down too much = big divot, hit too much up = no divot). Don’t try and emulate the best in the world when it comes to divots or you will probably leave a lot of greenkeepers unhappy!